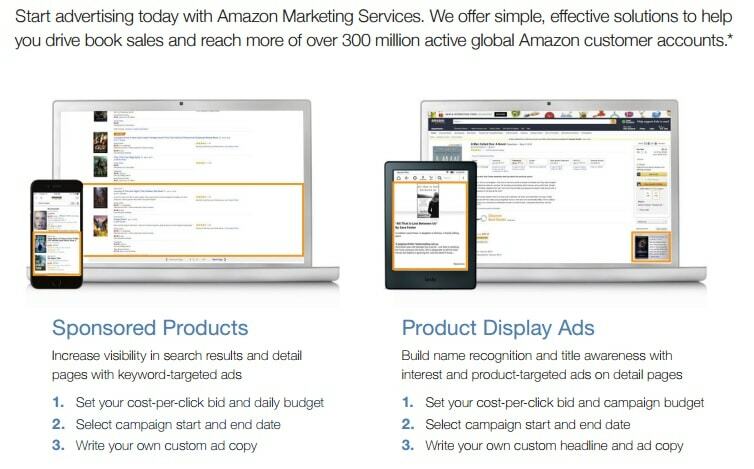 Starting in January 2015 Amazon offered authors and publishers the opportunity to buy ads on its site. The feature was only open to authors with titles in KDP Select, but earlier this year Amazon made it available to all KDP users. Self-Publisher-Bibel.de has noticed that Amazon has updated its KDP support pages with new instructions on how authors can advertise their ebooks on Amazon.com. The ebooks have to be available in KDP, they must be written in English, and the ebooks also have to meet Kindle Author Creative Acceptance Policies(PDF). So long as the ebooks meet the minimum requirement, authors can buy ads on other books listing pages, on the Kindle and Fire tabletes, and they also have the option to buy ads which infest Amazon's search results. This service is apparently only available on Amazon.com at this time. Or rather, we have a report that it is not available through Amazon.de, and I could not find it on Amazon.co.uk. But since there is no mention that this service is restricted to US authors, all authors should be able access it through their KDP.Amazon.com account. I received the email from Amazon Marketing Services telling me I could now advertise on Amazon. I went to the link and tried to determine if KDP Select was required. There was some confusing language that seemed to imply that if I enrolled for ads I was consenting to KDP Select. To clear up the confusion I emailed KDP Customer Support. My email said: So my question is: can I run an ad campaign without the book being enrolled in KDP Select? Their answer: No, the Ad campaign cannot be run for a book which is not part of KDP select. So maybe customer service didn’t get the memo yet, but I’d be careful. I received an email from Amazon UK about this so presumably it is US and UK. I would think it is available to everyone with books on Amazon.com, no matter what country they are in. I’m in Select, so I’ve been running sponsored ads since Amazon introduced them. I love ’em because not only do sponsored ads show on Kindle screens, but they now show up in a line below Also Bought with the ad text. I also have colleagues in KDP who have set up those ads with no restrictions or inference that a book must be in Select. I’m a UK author and we have to publish with the US site, it’s the only option. I have just had an ad approved for a book that is NOT in Select – no problems and it hasn’t been moved into Select as a result, so nothing to worry about. This is a great step forward in Amazon’s facilities for those of us who do not wish to be tied in to the Select programme.